« CELEBRATE WOMAN POWER WITH WOMANDLA! 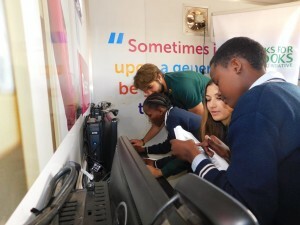 The first digital Boks for Books library, a Solar Powered Learning Lab, was launched by the Dell Development Fund, in conjunction with SA Rugby, at Emdeni High School in Soweto on Wednesday. The Dell Solar Powered Learning Labs are shipping containers converted into self-sustaining computer facilities, complete with curriculums for schools and access to local communities. SA Rugby President, Mr Mark Alexander, and national team players Lood de Jager and Chané Stadler, attended the launch event in Soweto on Wednesday. “We all know that education is a key cornerstone for success in life, and a vital part of a sound education is literacy,” said Mr Alexander at the unveiling of the Dell Solar Powered Learning Lab at Emdeni High School. “All of us in rugby, along with our partners Dell, wholeheartedly agree that literacy and education, and the discipline associated with that, play a crucial role in securing a strong future for our nation. “The Dell Development Fund remains committed to improving social conditions, made evident through the highly successful Solar Learning Labs project. They believe that technology is a powerful tool for breaking down barriers and opening up new possibilities for children around the world.